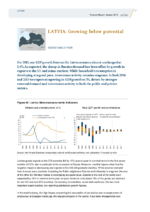 For 2015, our GDP growth forecast for Latvia remains almost unchanged at 2.4%. As expected, the slump in Russian demand has been offset by growth in exports to the EU and Asian markets. While household consumption is developing at a good pace, investment activity remains stagnant. In both 2016 and 2017 we expect an upswing in GDP growth to 3%, driven by stronger external demand and investment activity in both the public and private sectors.